Uganda’s President Museveni has held a couple of bilateral meetings with fellow regional leaders, their discussions being dominated by themes of security, integration and how to strengthen economic ties at the end of the 32nd Summit of African Union Heads of State. President Museveni told his colleague that Uganda has security concerns about the presence of the Allied Democratic Forces (ADF) terrorists in Eastern DRC and would appreciate if the Kinshasa government helped uproot them. “Our main interest is to dislodge the ADF. We cannot keep ADF in DRC. We cannot harbour ADF in Eastern Congo. Uganda is ready to help,” pledged the President. He also asked President Museveni to support him as he seeks to build a broad government, which will work for the economic success and political stability of the DR Congo. The two leaders also discussed the issue of the Ebola outbreak in Eastern Congo, with the Health Ministry Permanent Secretary, Dr. Diana Atwiine, indicating that the threat had been controlled. 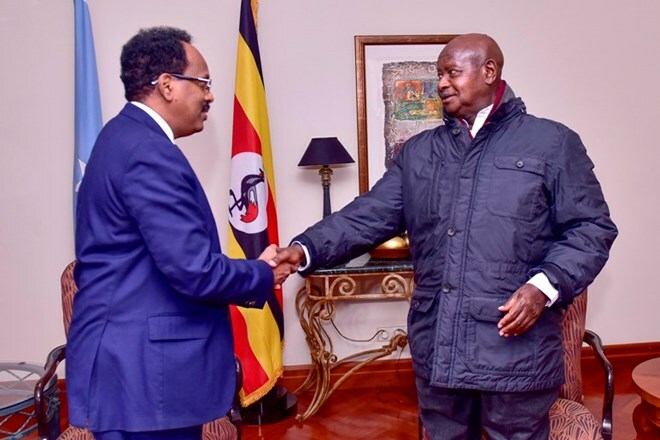 In a meeting with Somalia’s President, Mohamed Abdullahi Farmajo, Mr Museveni advised the former’s government to create a local loyal, voluntary military militia willing to protect and pacify the country, which gradually can grow into an affordable National Army in two years. Mr Abdullahi agreed with President Museveni, adding that the process of building a National Army was in its formative stages. He invited President Museveni to visit Somali to witness stages the political and security recovery his country has undergone since the Uganda People’s Defence Forces (UPDF) went to Somalia under the African Mission to Somalia (AMISOM) banner to fight Al-Shaabab terrorists who had taken over the Horn of Africa country. President Museveni also met Kenyan leader, Uhuru Kenyatta, with whom they discussed issues of political and economic cooperation of their two countries. Thereafter, President Museveni departed Addis Ababa for home and seen off at Bole International Airport by the Ethiopian Chief of Protocol, Mickel Tobias, Ambassador Rebecca Otengo, Maj. Gen. Francis Okello of African Union (AU) Peace and Security Department, among other officials. The President was received on arrival at Entebbe International Airport this morning by Minister for Presidency, Hon. Esther Mbayo and senior security officials.